One of the best values in its class, the tough, little Solaris® Multigas Detector features rubberized armor to help it absorb impact and an IP 65 rating that offers superior protection against liquid and dust ingress. It picks up O2, H2S, CO and combustible gas simultaneously and includes user-modified instrument functions - alarm set points, calibration gas values and an industrial hygiene function. Visual, audible and vibrating alarms are also standard. 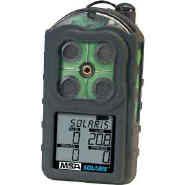 The Solaris Multigas Detector is available with rechargeable lithium-ion (14 hours of run time) or alkaline battery packs (12 hours of run time), too. Two-year warranty.